I love burgers! When I was pregnant with my twins I ate a cheeseburger almost everyday. I was so sick and for some reason my stomach could handle eating a cheeseburger without any issues. Cheeseburgers are also one of the few meat meals that my oldest daughter will eat. Naturally we like to grill cheeseburgers often in my house in the summer. While I will never get tired of eating cheeseburgers, it's fun to change it up sometimes. I got on a huge Greek food kick last summer. My Chicken Gyro recipe became one of my favorite meals and one of my most repined recipes. 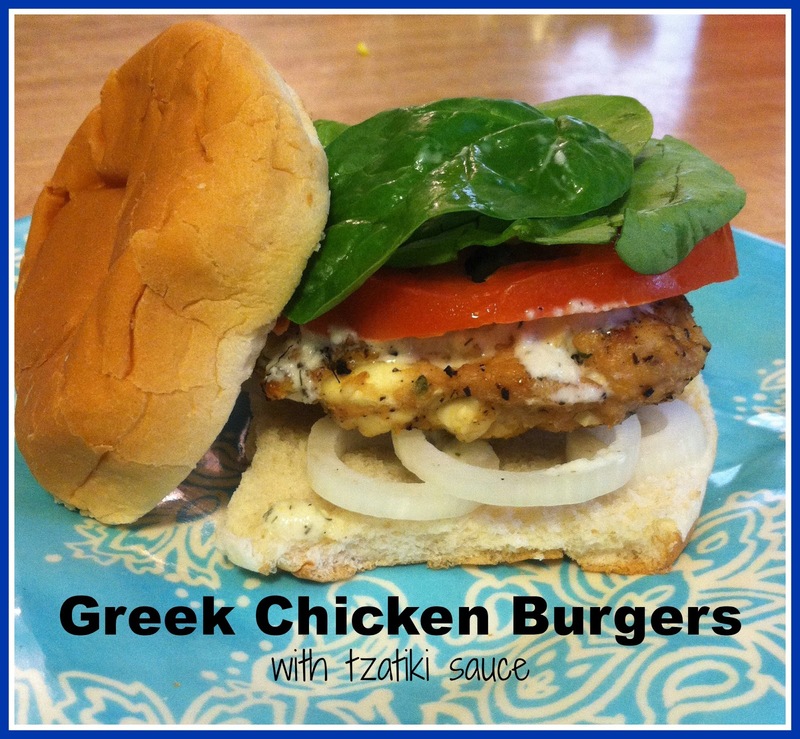 One day when I was at the store they had ground chicken on sale and I just knew I had to create a Greek Chicken Burger. This burger will make anyone a fan of Greek food. It is amazing! My oldest who won't eat chicken ate it! Although I may have lied to her and told her that it was made with sausage. Yea, I definitely lied to her, if she's ever in the kitchen with me when I pull out the meat I'm screwed since she can read now. I serve the burgers with an assortment of toppings and I let my kids assemble their own burgers. They all love the tzatziki sauce that you just have to top your burger with. Trust me, this burger is not be the same without the sauce. *If you buy ground chicken with less than 20 fat add in 1t to 1T of oil. You need fat in your burger so it doesn't dry out. 1. Make the sauce first. Peel the cucumber and cut into pieces. In a food processor combine the cucumber, olive oil, yogurt, garlic, 1/2 t dill weed, lemon juice and zest, and some salt and pepper. Blend it up and taste it, add more seasoning depending on your preference. Warning - the flavors come together as it chills so don't go overboard with the seasoning. I made my sauce about an hour before we ate and it was much better at dinner than when I tasted it while I was cooking. Place in a bowl, cover and refrigerate. 2. Combine all the burger ingredients in a large bowl. Form into patties. I made two large burgers and 3 smaller burgers for the kids. If you're feeding adults, this will make 4 large patties. Once your patties are formed sprinkle on a little extra salt and pepper on top. I'm not sure where I was hiding the fifth burger during this picture. 3. Grill burgers over med-high heat flipping once when they are halfway cooked. Your cooking time will depend on the heat of your grill. I cooked mine for 4 minutes on each side. Check your burgers with a meat thermometer, once it reads 165 you can pull them off. 4. Assemble your burgers at the table and enjoy. I know I am going to like this dish. I hope my family will too. I'll be making it this weekend.